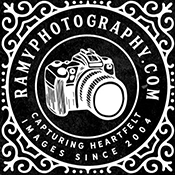 Ramyphotography is owned and operated by a husband-and-wife (and their seven-year old daughter) team. Ramses, the main photographer, started photographing weddings in January 2004. He would rather be in the background and capture the day instead of directing it. He prefers candid to traditional photography. He believes that practice and timing makes a perfect photo. Michelle mainly edits Ramses’ work. She is the company’s Photoshop guru. She is an avid scrapbooker and believes in a well balanced composition. Michelle is also Ramyphotography’s back up/additional photographer. Aubie, their five-year old daughter, now owns an Olympus Tough waterproof digital camera but is not yet ready for prime-time. Ramyphotography documents the heartbeat of weddings from the point of view of a photojournalist. They are always on a quest for the human element of the festivity. The one that defines our humanity – the unadulterated surge of joy. Ramses’ definition of a candid photo is one that captures the bliss on a bride’s face as she indulges on what a beauty salon has to offer. The satisfaction that she feels as she examines her nicely painted toes. The racing anticipation etched on her face as her veil is fastened on her hair. At the right timing, it is also one that depicts her excitement as she walks down the isle with her father. Ramses also loves to capture the emotion surging through a mother’s eyes in the form of tears. And the mischievous smiles of her sibling who gets to inherit her room when she has flown the coop. Weddings are filled with that human factor. You might laugh, cry or you might laugh and cry. It is truly the day that you will never forget. However your day will turn out, be rest assured that they will be there to capture it. At the end of the day, Michelle looks through each and one of your photos and make sure that they are in Ramyphotography’s standards. What’s my philosophy about shooting a wedding? Marriage is one of the most important chapter in a person’s life. I respect that importance and make sure that nothing is left to chance. Your day is all about you. But wedding is also one big party! And I love to party! What kind of cameras I you use? I love Canon products! To be specific, I shoot with a Canon 5D Mark iii. Do I bring my own equipment? Of course! And back up equipment too! Am I open to a list of must-take photos (pictures you definitely want shot)? Of course! If you already have list, hand them over to me and I will work my magic. When can we see our pictures? The seeds of creativity takes about 4-6 weeks to sprout. Do you shoot more than one wedding a day? Only if you’re getting married more than once a day. What are your payment options? Cash, Check, Visa, Mastercard and Paypal. What is your refund policy? If by any fortuitous event, your wedding is cancelled, the amount you have paid us minus your deposit is refundable.